Recounting the jewel-like nature of his own mescaline experiences, Aldous Huxley mused that people’s attraction to gems, “clear or colored little rocks” may be due to their likeness to the visionary state. This is also perhaps one of the reasons that a lot of “hippie jewelry” favors the wire wrapping of precious stones. There has always been mystic qualities attributed to gems. In the abode of Indra, the Hindu God of Space, a vast and infinite web stretches across the universe. At every crossing of the net there is a gem so highly polished that it reflects all the numberless gems in the lattice. Jewel Net of Indra is a symbol of the boundless holographic nodes of observation and cognition, the web of consciousness connecting all beings. The 9th Annual Gem and Jam Festival in Tucson, Arizona is where we are off to next. Look forward to joining the Love Tribe at the world renowned Tucson Gem and Mineral Show, the biggest U.S. gem jamboree and mineral magnet in the U.S. since 2006. 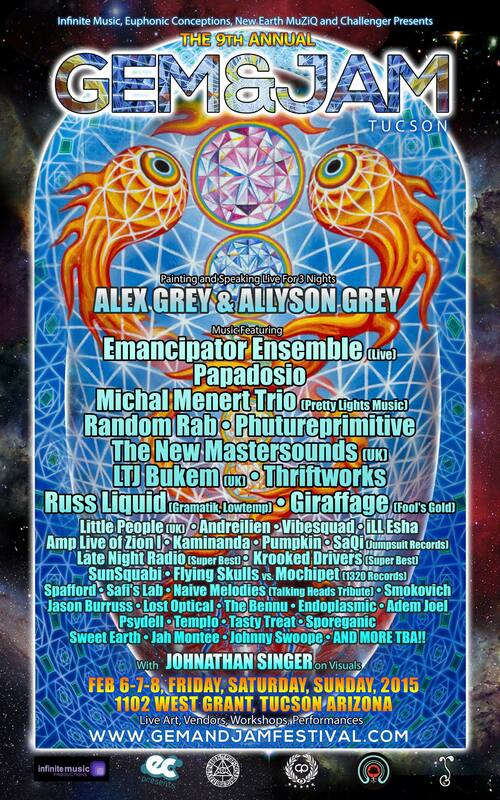 In the middle of the city of Tucson, an giant empty lot is transformed into festival grounds that hosts music, exquisite visionary art of all mediums, visual performers, live painting, a vast tribal market of food, crafts and apparel, workshops and lectures. Gems of Awareness is our art workshop where all levels of experience are invited to draw from the wellspring of our imagination along with eclectic vision evoking music. We will discuss and then visually dig for gems from our own visionary consciousness. Saturday from 1-4pm at Solar Culture, 31 East Toole Avenue. Jewel Net of Indra, painting by Allyson Grey, 1988, oil on wood, 48 x 48 in. Calling all lovers to join us for the Valentine’s Night dinner where we will enjoy delicious company and food, followed by fireside chatting with champagne and chocolate.